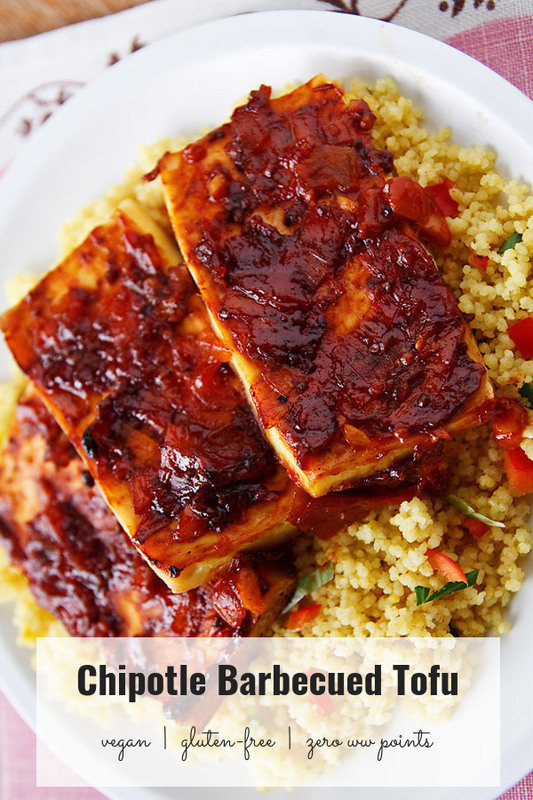 I love barbecued tofu, but I have to admit that I don’t always take the time to make my own sauce for it. The bottled stuff is so quick and easy, though I have yet to find a brand that I really like. I may stop using bottled barbecue sauce completely, however, after concocting this zesty new recipe. It has every flavor I look for in a bbq sauce: sweet, tangy, smoky, and spicy. And because the sauce is ketchup-based, it doesn’t take hours to make. I used Annie’s Natural ketchup, which contains less sugar that regular brands, and added enough chipotle peppers to normally set my family’s mouths ablaze. But somehow during the simmering, the heat mellows out. It was right on the limit of my daughter’s spice-tolerance, but she still managed to eat two servings. 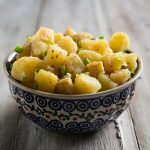 If you are sensitive to spiciness, try starting with less of the chipotles–perhaps 2 teaspoons rather than tablespoons–and add more to your taste. Of course, if heat is your thing, feel free to add more. Also note that you can make the sauce in advance, making it easy enough to bake the tofu in less than an hour. I’ve found that the easiest way to handle canned chipotles in adobo sauce is to pour the whole can into the blender and puree it. Then, I measure out what I need for the recipe and freeze the rest. Sometimes I use an ice cube try for freezing, but other times I just measure it out by the tablespoon into small snack-sized plastic bags. I put all the plastic bags into one large freezer bag which I label with the date. Chipotles will last for months in the freezer, and having the portions pre-measured makes it easy to add smoky chipotle flavor to chilies, stews or other dishes. 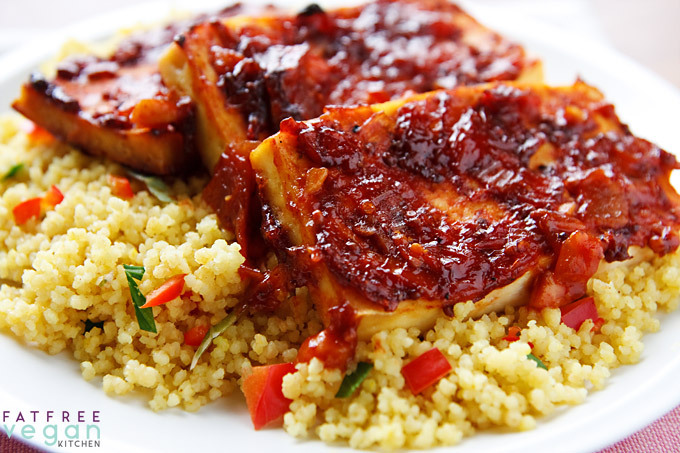 I served the barbecued tofu over some whole-wheat couscous that I flavored sort of randomly with saffron, fresh herbs, and minced pimento pepper. 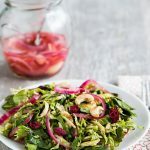 You can decrease the calories and sugar by using sugar-free ketchup and omitting the sugar or using a natural sugar substitute such as stevia, monkfruit, or erythritol. Slice each block of tofu into 9 slices. Place them on a double layer of paper towels or a clean tea towel (non-fuzzy) and place another double layer over them. Press firmly with your hands to remove as much moisture as possible. Let them sit on the absorbent material while you make the sauce. Heat a saucepan and add the onion. Cook, stirring, over medium-high heat until onion begins to brown, at least 6 minutes. Add the garlic and cook for another minute. Add all remaining ingredients (except the tofu) and cook, stirring, over medium to low heat, for about 15-20 minutes, until thick and fragrant. Preheat oven to 425 F. Place a silicone baking mat on a cookie sheet or oil a long, rectangular baking dish. 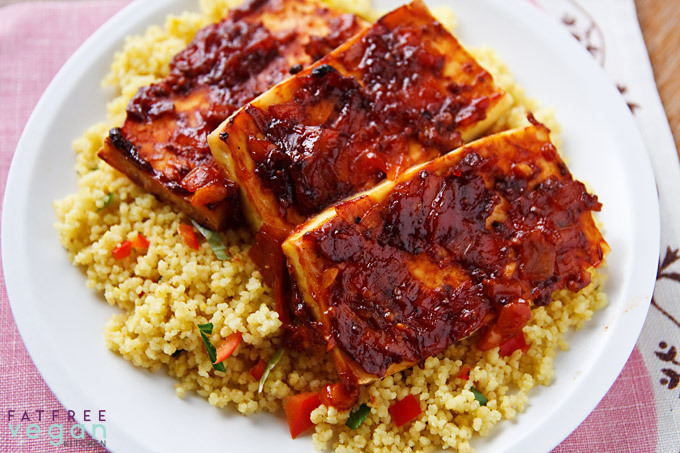 Brush one side of each slice of tofu with a thin layer of sauce and place it on the pan sauce-side down. Spread remaining sauce on the tops and sides of the tofu. Bake for about 25-30 minutes, until tofu is firm and just beginning to brown at the corners. Serve hot. Makes 18 slices. A serving is 3 slices. Nutrition is calculated using ketchup with sugar and turbinado sugar. 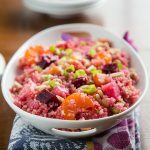 You can make this sugar-free by using a no-sugar ketchup and a pinch of stevia or other sweetener to taste. Removing the sugar makes this zero points on Weight Watchers Freestyle program. With regular ketchup and sugar, it is 2 points. Susan, that BBQ looks so tasty. Can you use frozen tofu? I usually freeze mine because I don't want it to spoil before I get to use it. Sure, Laina. If you like the texture of frozen tofu, you'll love it like this. Yum! I loved Tofu. Thanks for the recipe. made this last weekend for a bbq and it was delicious, I had to tweak it as it’s impossible to find chipotles in adobe sauce here in Ireland but I had some dried chipotle’s and soaked them and added a tin of tomatoes. everyone loved this including the death munchers who put it on their ribs. This is a great way to cook tofu. My family and I are always trying out new ways. Going to have to give this one a shot! Can I use chipotle chili powder instead of chipotle chiles in adobo ( which I cannot find anywhere in Italy)? If so, how much of it should I use? Just start with a small amount and taste the sauce. Keep adding until it is the right spiciness for you. It will be a little less spicy after cooking, so don’t panic if you add a little too much. Mmmm this was so good! I was disappointed that we only had firm tofu to use, but the BBQ sauce was really great. I live in Texas and I’ve had plenty of them; I should know! 🙂 The amount of chipotle was perfect for me, my husband could have used a bit more, and my daughter a bit less. 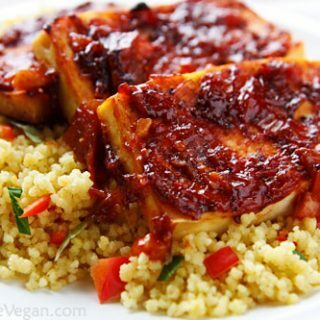 I’d love to experiment with the sauce on some tempeh. The colors in this are amazing! 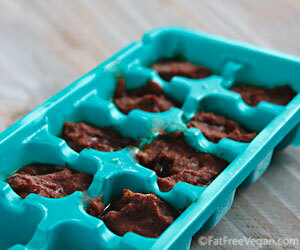 I am one week into a vegan diet and decided to make this recipe for dinner tonight. I can not tell you about the finished product but I LOVE the sauce! I need to stop eating it so I can put it on the tofu 🙂 I only did 1 tbsp chipotle sauce, but for my daughter it will be perfect and it is still spicy enough for my dh and I. Thanks for all the great recipes! I look forward to trying more! We tried your chipotle tofu recipe and it was delicious, I just added peppers, mushrooms and some spices to the couscous. 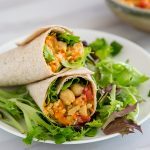 Love your site we are newly vegan only 5 months and I have used several of your recipes, thanks so much. As a vegan with a carnivore family, I am thrilled with your emails. I don’t cook with any oils and they may question my methods, for the most part they are embracing my vegan ways. (when in Rome) I look forward to your posts. The problem is The meals are delish but with food issues i cook but don’t eat. thanks for no oil. I hate oil..keep concocting great ideas. Really good. Hubbs loved it and so did I. Thanks very much for all you do.